We arrived at our accommodations for the weekend with a few hours to spare before dark and wasted little time unpacking so as to get to the waters edge as soon as possible. 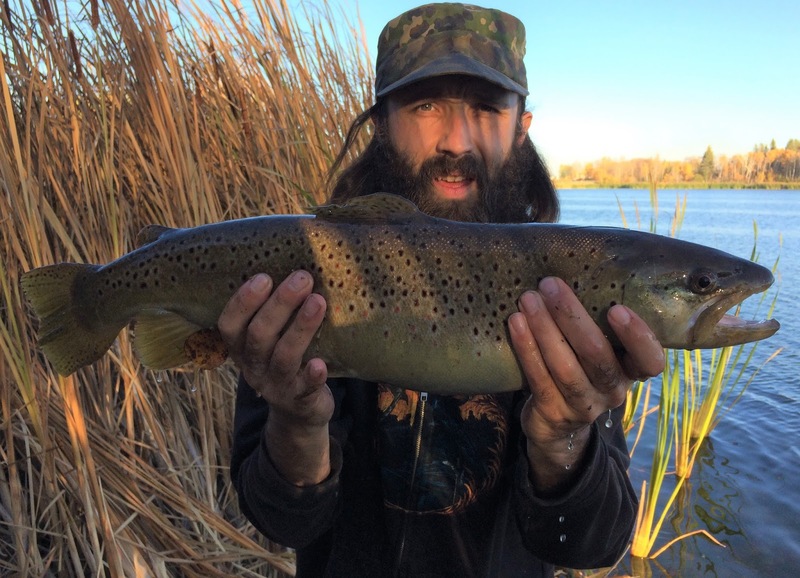 Rainbow and brown trout would be our target for the first session with the two closest lakes being known for cranking out trophies of both. This is due in part to the efforts of many parties, through stocking, aeration, regulation and promotion. The weather warm and leaves falling all around us, we were greeted with a bit of a foul stench coming from the water which was slightly concerning. The aeration was running as well which I found weird as that is usually only activated in winter. 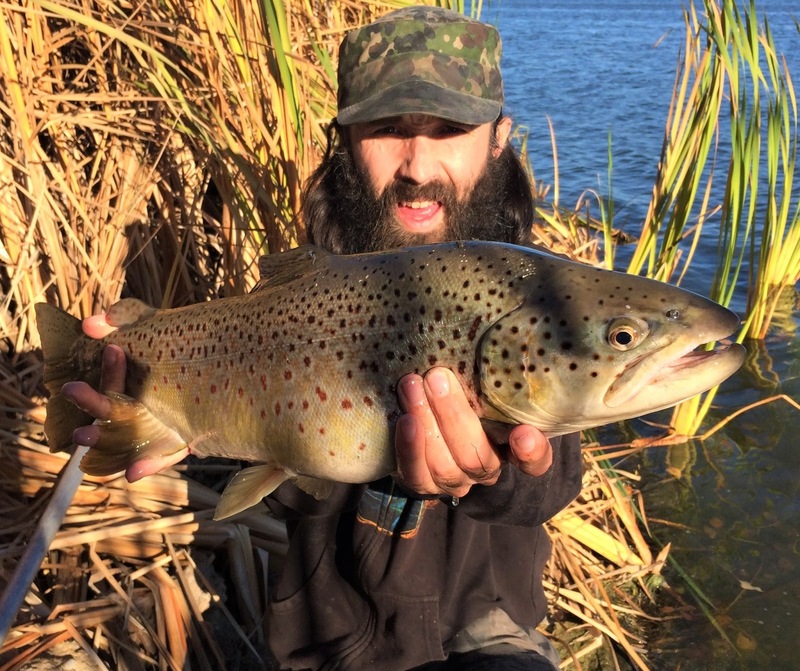 Before we could rig our rods and cast out, we saw two reputable sized trout breach within casting distance. The water was smelly, but at least we knew there were fish around. My first hit came after roughly ten casts of a small Len Thompson spoon and fairly close to shore I might add. Breaching almost instantaneously in the shallow water, it thrashed and dug down only to breach again and shake the hook. It was a brown trout and looked over two feet in length and I was furious as I had it in my head that the fish I just lost was clearly not going to bite again. My wife was able to bring the first fish of the trip to shore and I got it in our over-sized net with ease. This net makes an excellent "live well" for hook extraction and being able to keep the fish in the water before pictures. A rainbow trout measuring out over 20 inches in length sat in our net and we agreed against pictures as it seemed lethargic and tired from the battle. After a good bit of recuperation it swam off slowly, which is not how trout usually release this time of year. 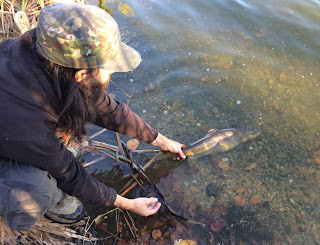 Shortly after releasing the rainbow I hooked into a decent brown trout that put my gear and I through the gauntlet. It smacked my spoon close to shore like the previous one and peeled off towards the weeds only to rocket out of the water and change course. It was doing everything in it's power to shake the hook loose and I was maintaining tension as best I could. The battle continued with a few more heart stopping breaches and once it was near shore and got sight of the net, off it went again, charging to the depths. It looked a little smaller than the one I lost but still well over 20 inches and after another run, I had her in the net. She measured out at 23 inches and was clearly well fed. With 2 hours of sunlight to go, we fished on, with many bites and takes missed and a few more trout landed. My wife caught some more feisty rainbow trout and I was able to bring another female brown trout to shore over 20 inches in length. She fought as furiously as the previous one and although light conditions were not ideal for photos, her colours were beautiful. Our first session was a success however the weather was about to change, surely leading to tougher fishing conditions. With two and a half more days to fish, we weren't deterred and formulated a plan to scout around some other lakes the next day.